The DX Stroller, known for its style and safety, now comes with double the impact with the Side By Side version that fits through standard 30" wide doorways. It's functional, elegant, and oh so handy when two passengers need to be handled with safety and ease. Measuring only 29" wide, made with a lightweight frame, and fitted with 360o swivel shock absorbing front wheels, the DX Side By Side Stroller makes moving two toddlers as easy as handling just one. Its durable sport color fabric makes the stroller as sturdy as it is stylish. The compact umbrella fold also makes for easy storage and travel. As with all Delta Baby Gear products, the DX Side By Side is designed with both the child and adult in mind. To that end, the 3 point harness keeps baby strapped safely for the ride. For the parent, a cup holder with 2 attachment points, and 2 hanging storage bags, makes the walking experience practical and fun, too. 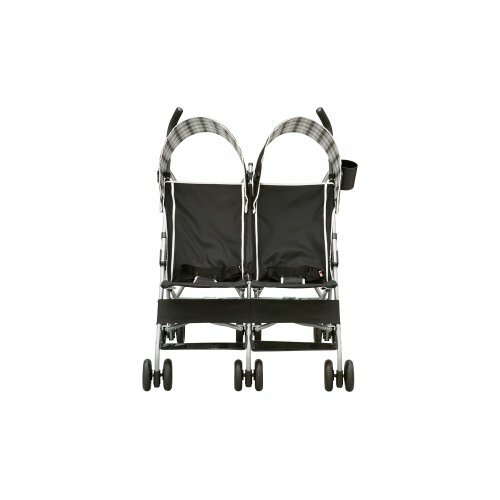 The DX Side By Side Stroller is JPMA certified, meets or exceeds all ASTM standards, and conforms to all CPSC standards. Recommended for use up to 35 pounds in each seat, the DX Side By Side allows for the safe, comfortable, and easy transport of two loved ones in one great stroller.